Geoff had a few days off from work, and I had rented a car, so we decided to hit the road and do some visiting. 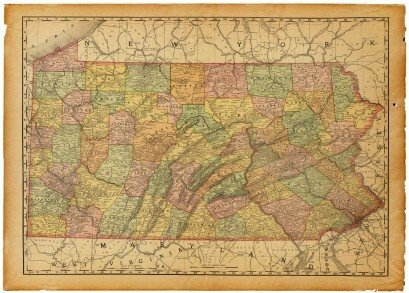 Pennsylvania is a BIG STATE! (Texas is my adoptive home, and I know from big states. PA: Big.) You can check a Google map: Edinboro, PA, to Warren: Warren to Cornwall: Cornwall to York: York to Pittsburgh: Pittsburgh to Edinboro. We paid calls on my brother in Warren; my 101-year old Aunt (truly the “last of the Mohicans”) in Cornwall; a “cousin by choice” in York; and back to feed a pack of starving students at my son’s place in Edinboro. When I turned in the rental car at the Pittsburgh airport last Thursday, the attendant said, “WOW–you put over 1,000 miles on this car!” I felt a little wistful to acknowledge with my son that the days of the Great American Road Trip may be over for good. It felt great to get in a good last shot at it. Why do I tell you this whole travelogue? Ah, dear reader, because the entire trip took me not just to Pennsylvania, but into Non-Habitual Action. That’s the whole point of a vacation, if you think about it. Well, I came right up against some of my deeply ingrained habits, and it wasn’t easy, to tell the truth. We always do what we always do—and I am no exception. For starters, food. The grocery store was set up wrong. Not only wrong, but idiotic. More to the point, it was not arranged like my favorite store at home. I kept having to backtrack to find the things I needed, the produce was very limited, and prices seemed higher. Although we visited two really terrific restaurants, the casual dining scene there is dominated by fast food chains or the ubiquitous “family restaurant,” where cottage cheese, stuffing, and mac & cheese appear on the veggie menu. I wouldn’t have described myself as a picky eater. When it comes to food, we all have our habits and preferences, easily overlooked until some adaptation is required. I had a blast cooking for my son and his friends, and I think it’s the most appreciative audience I’ve ever “performed” for. He and his roomies have a decent stock of kitchen utensils, pots and pans, even proper dishes — impressive. I found that they needed a good knife, a vegetable peeler, a grater, and dish towels. And a blender! It then felt more like my kitchen, and I was better able to function, as I learned what they had and made my own additions. Did I adapt to them, or did they adapt to me? Probably some of both. They are already adjusting to the “improvements” quite nicely. The other habit I encountered had to do with my driving. In PA, the speed limit is 65, tops. Most places, 55 or less. And get this, they actually enforce the speed limit. Cops and state troopers were everywhere. I had a really hard time keeping my speed under my habitual “comfort zone” for highway driving, 70-80 mph. In Texas, if you go 65, you’ll never get anywhere. I realize I am making light of a serious safety issue. I was aware the entire time behind the wheel that I was having to pay attention to things I don’t really give a second thought to when I’m at home. Happily, I drove sensibly and escaped without a ticket. I wonder how long my better driving habits will last, when I get back to Houston traffic? I learned, again, that adaptation is a challenge. In the case of food preparation, I was most comfortable adapting my surroundings to my preferences, rather than changing my preferences. With driving, I had to adjust to an unfamiliar car and the prospect of undesirable consequences if I didn’t curb my speed. With the grocery stores and restaurants, I mostly complained and then just made it work. Sometimes an adaptation causes additional trouble. For example, if you’re dealing with chronic pain, a recurring injury, or insomnia, all require adaptations that can wear you down over the long haul, and can make some problems worse. As human beings, we are “engineered” to be almost infinitely adaptable. Sometimes you adapt just to do the best you can. And as you know better, you can do better. The Feldenkrais Method helps people to make the most of their ability to adapt, to learn, and to thrive. Some habits evoke irritation as we examine them, like a tendency to drive too fast or exercise to the point of exhaustion or injury. Others, like having a new kitchen tool, can lead to more versatility, more possibilities, more enjoyment as we go along. Our functioning always improves when we’ve experienced some choices, and when we’ve had the opportunity to fine-tune what works best. Each Feldenkrais lesson helps you to discover your own best actions, in whatever activities you enjoy. Like a good vacation, each lesson brings learning, renewal, and enjoyment, a new lease on life as you return to your routine. What is routine for you? How do you adapt?